• UNFRAMED Make an unique style statement with this Hello Gorgeous Eyelashes Print. 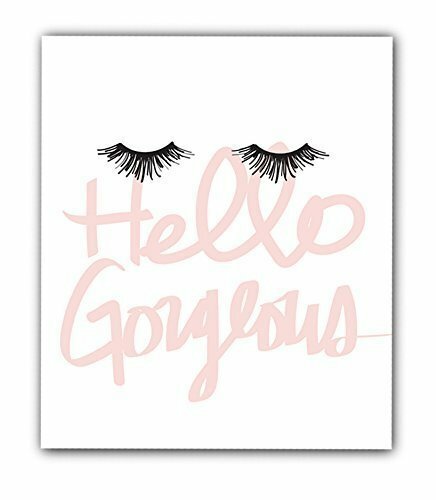 Our popular "Hello Gorgeous" Lashes print is a pretty statement piece for any room or Boss Lady office. • Salon Owners: This print is also perfect for a Lash studio or Hair salon decor blown up to really make a statement. •This listing is for a print only. This print does not come framed. • Dimensions 12"x12", 12"x18", 16"x20", 18"x24", 24x36"
• Museum-quality posters made on thick, durable, matte paper. A statement in any room. These are also archival, acid-free paper. • Prints arrive unframed and unmatted, ready to be placed in your favourite frame. Our prints look beautiful framed.. If you have any questions about this product by Designs by Maria, contact us by completing and submitting the form below. If you are looking for a specif part number, please include it with your message.